Allergy Advice: Contains Wheat, Barley, Gluten, Milk, Soya. Additives are derived from plant and synthetic origin. Store in a cool and dry place. Avoid direct sunlight and high temperature. Ingredients: Wheat Flour, Oat, Vegetable Oil (Palm Oil, Hydrogenated Rapeseed Oil), Butter, Salt, Leavening Agent (Sodium Bicarbonate), Malt Extract (Barley), Malt Flour (Barley), Yeast, Miso Powder (Soybean), Dough Conditioner (Starch, Yeast Foods (E510, E170(i)), Flour Treatment Agents (Alpha Amylase, Protease)), Flour Treatment Agents (Papain, Xylanase). 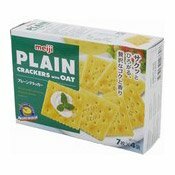 Simply enter your details below and we will send you an e-mail when “Plain Crackers With Oat (梳打麥餅)” is back in stock!